江建慧, 吴捷程, 孙亚. 一种基于异常控制流的错误程序行为分析方法[J]. 同济大学学报(自然科学版), 2018, 46(7): 972-981. 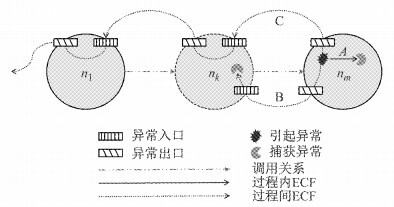 DOI: 10.11908/j.issn.0253-374x.2018.07.016. 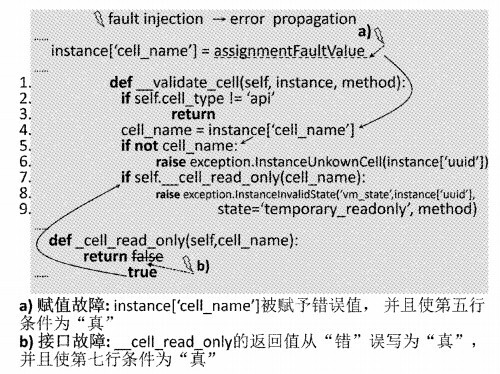 Abstract: In this paper, the propagation process of "fault-error-exception" chain in programs is analyzed by fault injection experiments. 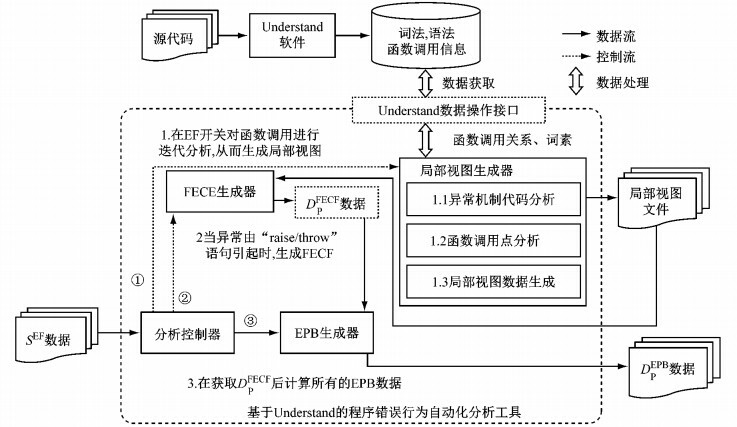 With representation of the exception control flow at function level, the error and its impact on program behavior are analyzed, a model of erroneous program behavior is established. An automatic analysis tool based on the proposed approach is developed and is used to analyze the erroneous behaviors of the significant components in OpenStack. The experimental results validate the validity and rationality of the proposed approach, which provides a new means to automatically analyze the erroneous behavior and collect the valid error set for large-scale programs with exception handling mechanism. 具有代表性的软件差错数据获取需要分析软件的功能特性及其在某个故障/缺陷被激活后所表现出的错误行为[2-3, 5]，工作量很大，且分析周期很长[1, 3].常见的正交缺陷分类(orthogonal defect classification, ODC)所属故障被激活后所产生的程序差错形式随程序实现的不同而不同，可能以返回码或共享变量的形式存在于应用程序与其使用的库函数之间[2, 6]，也可能以异常的形式在程序中进行传播[5-6]，或以跳转指令的组合形式出现. (4) π以路径的形式给出了Ψ的传播过程.若Ψ属于过程A或B，则π为no→nm→…→n1→nz，其中no，nz，nk(k=1, 2, …, m，m≥1)为Ψ所影响到的函数；若Ψ属于过程C，则π为no→nm→…→n1→nz→nout，其中nout为占位符，表示该路径对应的ECF未被捕捉. 根据EHM的性质，对于异常的传播及其处理过程，异常保护区z(try语句所保护的代码块)的异常保护序列EGS(z)指的是z对应的异常处理例程所组成的有序序列(c1, c2, …, cn)，n≥1，其顺序由z对应的异常处理例程的顺序决定.假如zj嵌套于zi之中，那么传播到zj中的异常首先会被EGS(zj)中的异常处理例程尝试捕捉处理，若该异常未被捕捉，则EGS(zi)再尝试对其捕捉处理，则LEGS(zj)=(cj1, cj2, …, cjn, ci1, ci2, …, cim)，若zi不嵌套于任何异常保护区中，则LEGS(zi)=EGS(zi)=(ci1, ci2, …, cim)，m≥1，n≥1.若语句s位于z中，则语句s受到LEGS(z)的保护，记为SLEGS(z).若有异常在s(raise/throw语句)处被抛出或异常传播至s(函数调用语句)处，若SLEGS(s)能捕捉该异常，则该异常在s语句所在的函数中被捕捉，否则该异常从当前函数传播出去且沿着函数调用栈逆向传播. 在形如(m1, m2, …, mn-1, mn)所表示的调用栈中，m1表示栈底，mn表示栈顶，n≥1.suc(mi)是mi的后继mi+1，n≥i≥1，suc(mn)=null.CTS(suc(mk))为函数mk中调用函数suc(mk)时的函数调用语句，且CTS(null) =null.为不失一般性，调用链的递归裁剪遵循如下规则. 规则1 设当前函数调用栈具有以下形式：(mbottom, …, M1, M2, …, Mn, M11, M12, …, M1n, …, Mk1, Mk2, …, Mkn, …, Mq1, Mq2, …, Mqp, mother, …)，其中，Mkn表示函数Mn的第k次递归调用，k≥1.Mqp表示函数Mp第q次递归调用, q>k, n≥p≥0.若∀i, j, k≥i, j≥1，式(2)得到满足，则调用栈可裁剪为(mbottom, …, M1, M2, …, Mn, Mq1, Mq2, …, Mqp, mother, …)，且FECF的o、t、z、e属性值保持不变，π中受到FECF影响的函数及其顺序不变. 实验在虚拟机上进行，操作系统为内核版本2.6.32的32位Linux，硬件配置为1GB内存，Intel(R) Core(TM) i3-3217U@1.80GHz单核CPU.实验负载为OpenStack(G版本)中的5个核心组件，该软件用Python语言编写，各组件的SEF数据均根据相应的应用程序编程接口(application programming interface, API)文档人工收集而得. MARINESCU P D, CANDEA G. LFI: a practical and general library-level fault injector[C]//Proceedings of the 39th IEEE/IFIP International Conference on Dependable Systems and Networks. Lisbon: IEEE, 2009: 379-388. 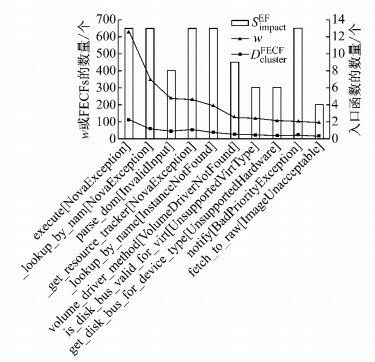 CHRISTMANSSON J, CHILLAREGE R. Generation of an error set that emulates software faults based on field data[C]//Proceedings of the 26th IEEE Symposium on Fault Tolerant Computing. Sendai: IEEE, 1996: 304-313. MORAES R, BARBOSA R, DURAES J, et al. Injection of faults at component interfaces and inside the component code: are they equivalent[C]//Proceedings of the 6th European Dependable Computing Conference. Coimbra: [s. n. ], 2006: 53-64. 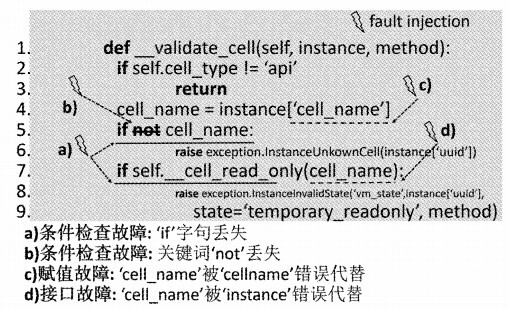 ZHANG P, ELBAUM S. Amplifying tests to validate exception handling code[C]//Proceedings of the 34th International Conference on Software Engineering. Zurich: IEEE, 2012 : 595-605. ARLAT J, MORAES R. Collecting, analyzing and archiving results from fault injection experiments[C]//Proceedings of 5th Latin-American Symposium on Dependable Computing. [S. l. ]: Sao Jose dos Campos, 2011: 100-105. JOHANSSON A, SURI N, MURPHY B. On the impact of injection triggers for OS robustness evaluation[C]//Proceedings of 18th IEEE International Symposium on Software Reliability. Trollhattan: IEEE, 2007: 127-136. SINHA S, ORSO A, HARROLD M J. Automated support for development, maintenance, and testing in the presence of implicit flow control[C]//Proceedings of the 26th IEEE International Conference on Software Engineering. Edinburgh: IEEE, 2004: 336-345. COELHO R, RASHID A, GARCIA A, et al. Assessing the impact of aspects on exception flows: an exploratory study[C]//Proceedings of the 22nd European Conference on Object-Oriented Programming. Berlin Heidelberg: Springer, 2008: 207-234.